The first time I passed by So Free, I wondered what all the people were doing standing around the rustic looking cabin. When I realized it was a pizza place, I had to give it a try. The menu at So Free Woodfired Pizza and Cheese is short, but sweet. Eight 8 inch pizzas cooked to order in a wood fired oven. And you can't beat the price at NT$120 for an 8 inch pizza with fresh ingredients, especially in comparison to the fancier options in town- Fifteen Pizzeria and Primo Trattoria pizzas run in the NT$300 range for the same size. The tradeoff for the lower price is limited seating and the limited selections of pizzas, especially if you're craving some pepperoni. All the pizzas are vegetarian. But So Free still keeps it interesting. 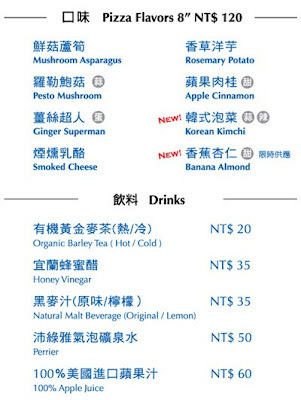 I'm not sure if I'd try the Korean kimchi and Ginger Superman, but the pesto mushroom and rosemary potato sounded appetizing. You can also appeal to your sweet tooth with a dessert pizza topped with apple cinnamon or banana apple. 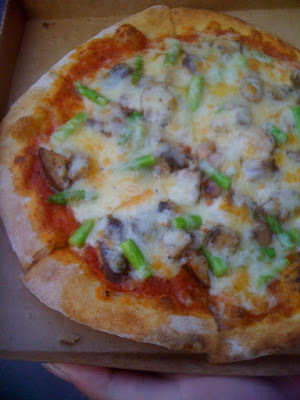 I tried the Mushroom Asapargus pizza which came fairly loaded with fresh ingredients- chopped asparagus and mushroom with lots of cheese and sauce. The crust is thick enough to hold all the toppings, but pliable enough to fold a slice in half for a bite for your mouth. The seating at the Gongguan eatery is extremely limited, so you can opt to wait awhile for a barstool seat, or do what we did which was order it to-go (which is still a good 10-15 minute wait when they are busy) and eat it at the adjacent park. It's also close to Tai Yi Milk King, so you can get some shaved ice afterwards if the weather is warm. I know I still have quite a few pizza places in town to try- some readers have recommended Mary Jane's Pizza and Le Rouge- but I'm slowly working my way through them all! Any others to add to my to-do list? And has anyone tried the dessert pizzas here? It's such an awesome feeling being half a world away from Taiwan, yet have a moment of: "I know exactly where that is. I've walked past that places hundreds of times!" I live right in the area. You have to try Fruegel (a German cake cafe, best cakes in Taipei I swear), and a place called Mr. Curry 咖哩先生. These are my absolute favorites. Yici, the owner of Freugel is very strict about using the best ingredients. She won't even let you take some stuff to go for various reasons. She even makes the creams herself! The girl is adorable. Lived in Germany for a while. Mr. Curry also uses only the best and freshest ingredients. He drives to the market every morning for the ingredients. He's a really funny and entertaining guy from Hong Kong. If you're facing TaiYi Milk King: Enter the alleyway directly to your right. Walk down the alleyway, pass a Korean restaurant on your left, Taiwanese book store on your right. You should also pass a cafe on your left called Continental, and another second hand book store. Fruegel is directly across the alleyway from that second hand book store. There isn't any indoor seating, just a sort-of bar type seating thing. Mr. Curry is just right next door to Freugel. (If you're looking at Fruegel, on the left is a small alleyway, walk like 3 steps into the alleyway and Mr. Curry is on your right). He has seating for about 10 people haha. It's really like you're eating in someones kitchen. At Fruegel, the cakes change everyday. Try the Indian Milk Tea though, it's delicious. mmm looks delicious! i will definitely have to check out this place, esp since it's so near me. I'm curious about the Korean kimchi and banana almond flavors. Part of me is horrified and the other part thinks it might be good. raymond: haha! cool. did you ever try it? eddie: thanks for sharing your prized finds! I'll have to give them a try! wandering chopsticks: i just don't know about bananas and cheese..
calvin: now you've piqued my curiosity about the kimchi pizza! Thanks for the review. I can't wait to try it. I love So Free! Personally I think it's better than Alleycats. Alleycats is 3 times the price and left me feeling overwhelmingly full. So Free is just the right serving. If I remember correctly my friend has tried the Ginger Superman and it wasn't bad. I have tried Korean Kimchee flavour and can attest that it's good! So Free Pizza is great. I ordered the mushroom pesto, smoked cheese, and banana almond. They were all very good even the dessert pizza which I normally don't care for. Only 135NT per pizza. I try to eat vegetarian most of the time also so it is great to have a great pizza option like this. You know that a pizza is really good when it tastes just as good with no meat on it.